Things I liked: This thing works great. I like being able to have my pellets ready to go as soon as I open the lid... slowly and carefully. Things I would have changed: A lower price would be nice. Of course, I feel that way about just about everything. What others should know: At 10 meter matches we shoot 3 sets of 20 shots. I placed narrow strips of thin transparent tape over rows 3, 6, and 9. This forces the box to fill rows 1-2, 4-5, and 7-8 with sets of 20 pellets each and leaves row 10 for sighters. Makes it a bit easier to keep track of shots. Things I liked: Kind of costly (for me), but I saw pretty much all the other shooters using these! They permit readily knowing how many pellets fired & how many left in stage shooting. They also protect pellets to both enable and see the flared ends are not distorted - optimizing accuracy potential. And, with the spring-loaded yellow plastic actual holder, it is extremely easy -- just pour in and jiggle tray -- to fill; plus, quite easy to select your pellet for loading. Imho, an accessory I'd surely not wish to be without! What others should know: No; a great product. Oh -- there is foam on inner top lid to keep pellets both secure and not rattlin' about. Things I liked: Very well made. Easy to load the 100 pellets. Real handy in a match. No fumbling in a tin for the pellet. You just reach down and pull out the pellet, already facing the correct direction. Easy to count your shots by glancing at the Box. What others should know: This is not just a plastic box. It's a typical German engineered product with the Shooter in mind. Things I liked: I use this box all the time. It's super easy to use and is so much nicer than picking out individual pellets from a tin. Makes keeping track of how many pellets you've shot much easier. Things I would have changed: I love the box but $20 for a plastic box does seem just a bit pricy. I would still buy it again though. Makes shooting easier and more fun. What others should know: After you fill it up with pellets, open it carefully or some of the pellets will jiggle out. Things I liked: Spring loaded. Holds 100 rounds neatly. Very easily loaded. Things I would have changed: Made the spacing between the pellets a little wider. Things I liked: Buy this box! Buy this box! Buy this box! Buy this box! Buy this box! The first time I invited my friend over to try put my new 10m range, he plops down this little blue box, and we start shooting side by side. I struggled with chasing around 10 tiny pellets in a tin lid, while he has his all lined up in a fancy blue box. Then when we finish with 10 strings of 10, he dumps a load of pellets on top, shakes them around, then pours pellets back in the tin. I look and he has 10 strings of 10 ready to go again. I ordered one for myself before we started shooting again. Things I would have changed: Pyramyd Air should offer this in a PPD with every airgun they offer! Shame on them for not doing so! What others should know: Buy this box! Things I liked: This is a pretty nifty little gizmo. I used it in a recent 10m match and it was easy to keep track of my shots. So, now I use it for practice sessions as well. It's easy to load and it makes it easy to check the skirts of your pellets for damage. Close the cover and the pellets stay put. Nice. Things I would have changed: The spacing is a little tight for my fingers. Another 1 or 2 millimeters between pellets would be good, but it's quite usable as is. The price could be a bit lower as it's all molded plastic. 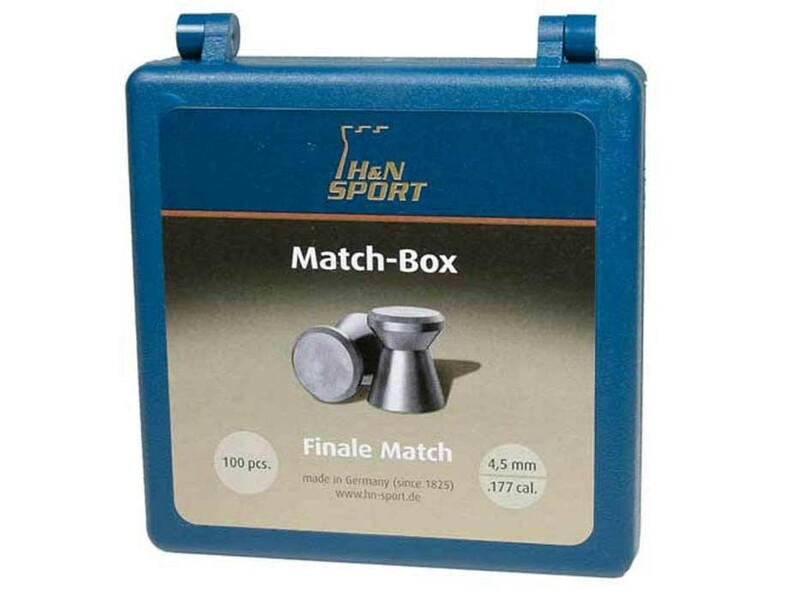 Things I liked: I can store different weighted pellets in the box and keep track of shot count when target shooting. Things I would have changed: Have all size pellets fit. What others should know: After i shoot, i reload the box with the pellets i want to use for the next time i shoot. Things I liked: It works, more or less. It does make tracking shot count easier. Things I would have changed: The spacing is a tad tight. I have large but not huge hands and it is very easy to fumble the pellets, especially when wearing shooting glasses. What others should know: Better than nothing. Unfortunately, there are no competitive products. Things I liked: This is a very cleverly designed item. The pellet tray (with the holes in it) raises and lowers by pressing on the tabs on the side of the tray. When in the up position, you only need to pour some pellets on the tray and swish them around. The heavy head of the pellet automatically falls into an empty hole. By pressing on the tabs again, the tray fixes to a lower position and, with the foam in the top of the lid, keeps the pellets in place, preventing them from coming out of the holes when the lid is closed. This is very good for protecting skirts of pellets made of soft lead. Good for use on the range as you can easily see how many pellets you've shot at a target. Easy to pick up an individual pellet, by contrast, when reaching into a tin, I frequently grab 2 or 3 pellets at once. And, the box top SNAPS shut, so you don't have problems with pellets falling all over the place if you drop it! Looks cooler than a tin. Things I would have changed: Price, seems a bit expensive for a plastic item, probably caused by the exchange rate between the US Dollar and the Euro. Nevertheless, I had one several years ago, which I lost, but will get another one. What others should know: Do you REALLY NEED one? No, but it is nice to have, easy to use, and serves the functions of protecting pellets and eases handling them. Things I liked: Works great! It's very easy to load! Things I would have changed: Too expensive! Things I liked: Should allow you to quickly and easily pick up pellets in the correct orientation for loading without even looking -- if you are using the right pellets. Things I liked: Lets my track the number of shots fired and allows me to easily inspect the pellet skirts for uniformity before the shooting begins. Things I would have changed: I think the use of four pellet plate springs ( one at each corner ) instead of two would improve dependability of operation. What others should know: This is a very handy target shooting accessories. Sometimes the pellet plate will get cocked to one side preventing all of the pellets from popping up. It's easy to fix but an aggravation to say the least. Doesn't happen very often. Things I liked: Easy to use. A good way to organize and inspect the pellets. Things I would have changed: A lower price would be nice. What others should know: This pellet box is easy to use. It takes less than a minute to fill the box with 100 pellets, and you can inspect their skirts before going to the range. It is also easy to keep the count of the pellets. A must have for target shooters. The first pellet box I received was damaged during, presumably during the shipping by the 20 tins of pellets that were also in the package. PyramydAir promptly shipped out a replacement, which arrived in perfect condition. Things I liked: I like the way this hold pellets and lets you check the skirts when loading it. It is quiet and easy to use. Easy to use to count shoots as you go as well. It takes a couple tries to get use to raising and lowering the deck but once you doe it is very nice! What others should know: Although a little expensive if your are true air gunner you should own at least one.